What is Langdon Wood “Smoke”? Pennsylvania Grade A Medium maple syrup cold-smoked with applewood in a specially adapted barrel and allowed to mellow in a rye whiskey barrel. LW Smoke is designed to bring a bit of the campfire into the kitchen. Use sparingly before, during, or after cooking to give food a sweetened, smoky flavor. When I cook outdoors I use a smoker fed with hardwood scraps from my woodworking business. I use it year round and am always looking for new things to try. Beef, pork, tofu, bread, lamb, goat, chicken, squash, chestnuts, and even wheat berries have been smoked and cooked on that grill. I once wondered, very briefly, if there was a way to smoke maple syrup. Since I had trouble keeping the temperature low and even I figured that it would be impossible to do it without burning the syrup or winding up with an ash-coated mess. But then I found myself with an empty brandy barrel. Once I bottled Brandytime (our Cactoctin Creek 1757 Brandy barrel-aged syrup) I was left, as always, with an empty barrel in need of a third use. It was October and my sister had just asked me if I could make another home-cured ham for Christmas. The last one I did was smoked at about 200 degrees for 12 hours with a near constant need for attention and I wanted to simplify things, so I looked into cold smoke generators. A cold smoke generator is a box or cylinder that attaches to a larger chamber. Combustion takes place in the generator and the smoke that gets pushed into the chamber usually ends up at about 90-100 degrees Fahrenheit. The advantage is that you can impart a strong smoke flavor to something without overcooking it or drying it out. I bought the generator after it occurred to me that I had a ready-made smoking chamber in the form of an empty brandy barrel. 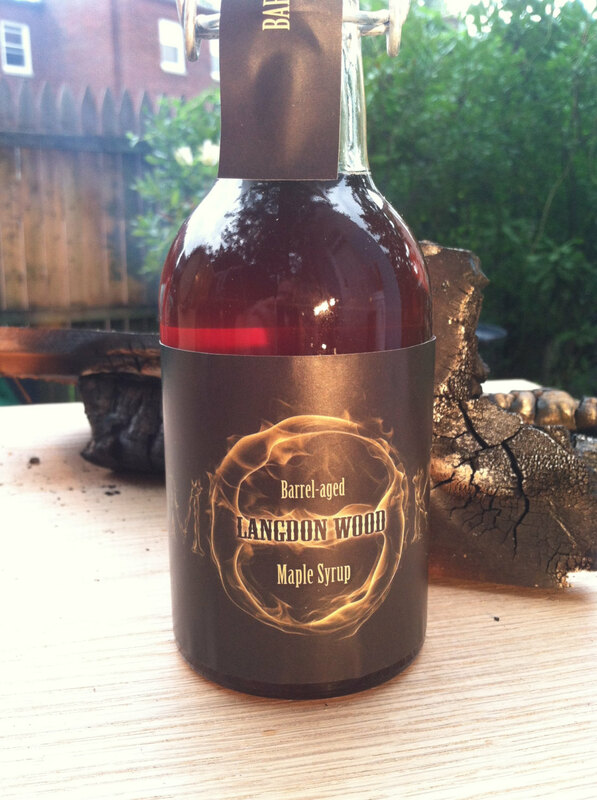 From there that faint thought of smoked maple syrup came back to me. If I was going to do it I would need to smoke the syrup prior to converting the barrel to a meat smoker. I put the barrel on a stand on its side and attached the generator to one head and poured in ten gallons of syrup. For ten hours I fed chunks of apple, peach, cherry, and maple wood into the smoke generator and let the smoke waft over the syrup. I pulled the now smoked maple syrup from the barrel, double filtered it, and poured it into a Catoctin Creek Rye Whisky barrel to age and mellow.